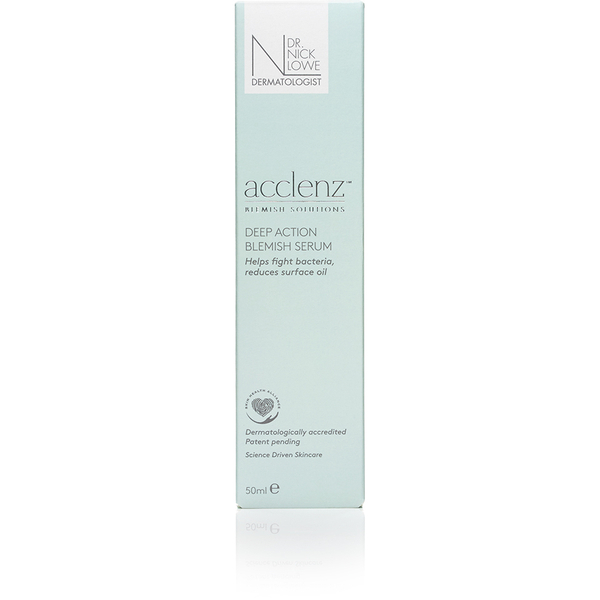 Combat spots and relieve irritation with the acclenz™ Deep Action Blemish Serum from Dr. Nick Lowe, internationally recognised as one of the world's leading experts in dermatology and skincare. 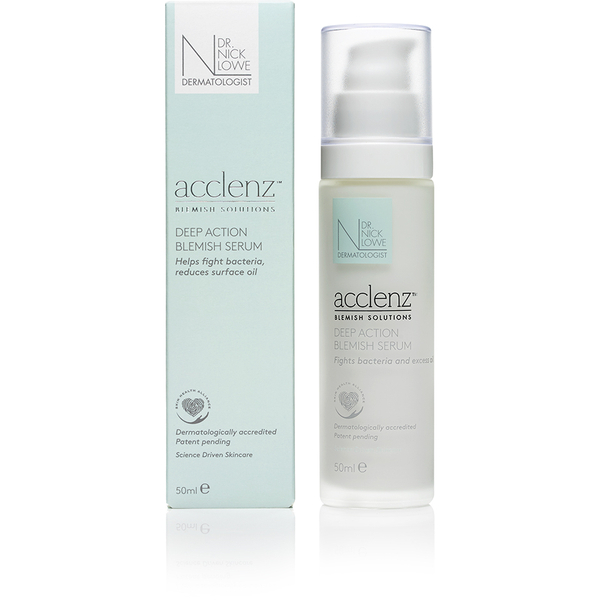 Combining fast-acting and slow-releasing ingredients, the powerful formula works to eliminate excess surface oil, whilst minimising the appearance of blemishes to leave skin clear, smooth and healthy-looking with a shine-free finish. Salicylic Acid, Niacinamide and Zinc encourage cell regeneration, and Eucalyptus Leaf Extract acts as an anti-microbial agent to inhibit bacteria growth, revealing a calm, comfortable complexion. Reduces pore size and soothes damaged skin. Use twice daily for optimum results. After thoroughly cleansing and drying the skin apply morning and evening, smoothing across skin until product is fully absorbed. Always apply day cream first. Aqua (Water), Glycerin, Isohexadecane, Cetyl Alcohol, Aluminum Starch Octenylsuccinate, Niacinamide, Cyclopentasiloxane, Polyglyceryl-3 Methylglucose Distearate, Hydrolyzed Corn Starch, Salix Alba Bark Water, Salicylic Acid, Cetearyl Glucoside, Phenethyl Alcohol, Glyceryl Stearate, Polyquaternium-37, Cocamidopropyl Dimethylamine, Zinc PCA, Parfum (Fragrance), Chlorhexidine Digluconate, PEG-75 Stearate, Steareth-20, Ceteth-20, Allantoin, Ethylhexylglycerin, Sodium Hydroxide, Tocopherol, Hydrated Silica, Polyquaternium-67, Disodium EDTA, Eucalyptus Globulus Leaf Extract, Lycium Barbarum Fruit Extract, Chamomilla Recutita (Matricaria) Flower Extract, Stearyl Alcohol, Potassium Sorbate, Sodium Benzoate, Sorbic Acid.